We know that humans reached North America between 40000 and 16000 years ago...and that's about all we know for certain. Anything in American prehistory before about 10000 years ago remains deeply controversial. But some mastodon bones found in the 1970s recently revealed major clues. The orthodox view of North American prehistory is that the oldest culture was the Clovis people, named after a series of discoveries in the late 1930s in Clovis, New Mexico. Dating back roughly 13,000 years, the Clovis culture is known from their distinctive tool designs, which they made from bone and ivory. For the last few decades, archaeologists have argued that it was the Clovis culture that migrated from Asia to the Americas, either over the Bering land bridge or by boats. A number of subsequent finds and studies have challenged this so-called "Clovis first" hypothesis, but finding definitive proof of pre-Clovis cultures has remained elusive. Now researchers at Texas A&M and the University of Copenhagen have teamed up to offer what could be clinching evidence that the Americas were indeed inhabited before the emergence of the Clovis culture. Their research rests on new analysis of mastodon fossils first discovered in the 1970s. Crucially, one of the mastodon's bones was pierced by a projectile point, itself made from the bones of some other mastodon. That means that this mastodon was killed by humans, and that it must have lived at a time that the Americas were inhabited. Back in the 1970s, archaeologists dated the bones to 14,000 years old, meaning it predated Clovis. But those findings were controversial in the larger archaeological community, with many arguing that there was a dating error. After all, there isn't that much difference between 13,000 and 14,000 years, and even as small a mistake as that would mean it dated to the same time as Clovis. 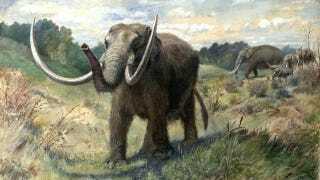 However, the Copenhagen and Texas A&M researchers have been able to bring the full suite of 21st century science to date the mammoth bones, including DNA analysis, protein sequencing, advanced computer technology, Carbon-14 dating, and comparison with other, more definitively dated mastodon findings from other sites. After all those exhaustive tests, lead researcher Eske Willerslev is confident that the bones are at least 13,800 years old. Whoever killed this mastodon all those millenniums ago, it wasn't the Clovis culture. It also means that mastodons weren't immediately hunted to extinction by the Clovis, as had previously been suggested. Humans and megafauna would have shared many centuries of relatively peaceful coexistence before they were finally driven to extinction. "Our research now shows that other hunters were present at least 1,000 years prior to the Clovis culture. Therefore, it was not a sudden war or a quick slaughtering of the mastodons by the Clovis culture, which made the species disappear. We can now conclude that the hunt for the animals stretched out over a much longer period of time. At this time, however, we do not know if it was the man-made hunt for the mastodons, mammoths and other large animals from the so-called mega-fauna, which caused them to become extinct and disappear. Maybe the reason was something complete different, for instance the climate." Previous research by Willerslev and his team indicates that the first traces of human presence in the Americas goes back at least 14,340 years. We know very little about these people, who quite likely were the original emigrants from Asia, but it's certainly possible that after several centuries of living in the Americas they began to develop Clovis technology. The exact narrative of ancient American prehistory remains mysterious, but we at least know it's longer and more complex than we previously imagined. Read the full scientific paper via Science. Artist's impression of mastodon by Charles R. Knight from 1897.